Bottecchia, C. and Noël, T. Photocatalytic modification of amino acids, peptides and proteins. Chemistry – A European Journal 2019, 25(1), 26-42 DOI: 10.1002/chem.201803074. Cambié, D. and Noël, T. Solar Photochemistry in Flow. Topics in Current Chemistry 2018, 376:45 DOI: 10.1007/s41061-018-0223-2. Laudadio, G.; De Smet, W.; Struik, L.; Cao, Y. and Noël, T. Design and application of a modular and scalable electrochemical flow microreactor. Journal of Flow Chemistry 2018, 8(3), 157-165 DOI: 10.1007/s41981-018-0024-3. Bottecchia, C. and Noël, T. Intermolecular Transition-Metal-Catalyzed C–C Coupling Reactions in Continuous Flow. Science of Synthesis: Flow Chemistry in Organic Synthesis 2018, 313, 313-346 DOI: 10.1055/sos-SD-228-00200. Booker‐Milburn, K. and Noël, T. Flow Photochemistry. ChemPhotoChem 2018, 2 (10), 830-830 DOI: 10.1002/cptc.201800184. Casnati, A.; Gemoets, H.P.L. ; Motti, E.; Della Ca, N. and Noël, T. Homogeneous and Gas‐Liquid Catellani‐type Reaction Enabled by Continuous‐Flow Chemistry. Chemistry – A European Journal 2018, 24 (53), 14079-14083 DOI: 10.1002/chem.201803909. Wei, X.-J. and Noël, T. Visible-Light Photocatalytic Difluoroalkylation-induced 1, 2-Heteroarene Migration of Allylic Alcohols in Batch and Flow. Journal of Organic Chemistry 2018, 83, 11377-11384 DOI: 10.1021/acs.joc.8b01624. Kuijpers K.P.L. ; Bottecchia, C.; Cambié, D.; Drummen, K.; Koenig, N. and Noël, T. A fully automated continuous‐flow platform for fluorescence quenching studies and Stern‐Volmer analysis. Angewandte Chemie International Edition 2018, 57 (35), 11278-11282 DOI: 10.1002/anie.201805632. Escribà Gelonch, M.; Halpin, A.; Noël, T.; Hessel, V. Laser mediated photo‐high‐p,T intensification of Vitamin D₃ synthesis in continuous‐flow. ChemPhotoChem 2018, 2 (10), 922-930 DOI: 10.1002/cptc.201800102. Straathof, N.J.W. and Noël, T. In “Visible light photocatalysis in organic chemistry”, Stephenson, C.R.J. ; Yoon, T.; MacMillan, D.W.C. Wiley-VCH, Berlin, 2018, pp. 389-413 DOI: 10.1002/9783527674145.ch13. Zhao, F.; Cambié, D.; Hessel, V.; Debije M.G. ; Noël, T. Real-time reaction control for solar production of chemicals under fluctuating irradiance Green Chemistry 2018, 20, 2459-2464 DOI: 10.1039/C8GC00613J. van Schie, M.M.C.H. ; Pedroso de Almeida, P.; Laudadio, G.; Tieves, F.; Fernández-Fueyo, E.; Noël, T.; Arends, I.W.C.E. ; Hollmann, F. Biocatalytic synthesis of the Green Note trans-2-hexenal in a continuous-flow microreactor. Beilstein Journal of Organic Chemistry 2018, 14, 697-703 DOI: 10.3762/bjoc.14.58. Laudadio, G.; Govaerts, S.; Ying Wang, Y.; Ravelli, D.; Koolman, H.; Fagnoni, M.; Djuric, S.; Noël, T. Selective sp3 C-H Aerobic Oxidation enabled by Decatungstate Photocatalysis in Flow. Angewandte Chemie International Edition 2018, 57 (15), 4078-4082 DOI: 10.1002/anie.201800818. Escribà-Gelonch, M.; Hessel, V.; Maier, M.C. ; Noël, T.; Neira D’Angelo, M.F. ; Gruber-Woelfler, H. Continuous-flow in-line solvent-swap crystallization of Vitamin D3. Organic Process Research & Development 2018, 22 (2), 178-189 DOI: 10.1021/acs.oprd.7b00351. Escribà-Gelonch, M.; Noël, T.; Hessel, V. Micro-flow high-p,T intensification of Vitamin D3 synthesis using a ultraviolet lamp. Organic Process Research & Development 2018, 22 (2), 147-155 DOI: 10.1021/acs.oprd.7b00318. Zhao, F.; Cambié, D.; Janse, J.; Wieland, E.; Kuijpers, K.P.L. ; Hessel, V.; Debije, M.G. and Noël, T. Scale up of a luminescent solar concentrator based photomicroreactor via numbering-up ACS Sustainable Chemistry & Engineering 2018, 6 (1), 422–429, DOI: 10.1021/acssuschemeng.7b02687. Noël, T. A personal perspective on the future of flow photochemistry Journal of Flow Chemistry 2017, 7 (3–4), 87–93, DOI: 10.1556/1846.2017.00022. Wei, X-J. ; Boon, W; Hessel, V.; Noël, T. Visible-Light Photocatalytic Decarboxylation of α,β-Unsaturated Carboxylic Acids: Facile access to Stereoselective Difluoromethylated Styrenes in Batch and Flow ACS Catalysis 2017, 7, 7136–7140, DOI: 10.1021/acscatal.7b03019. Laudadio, G.; Noël, T. Chapter 7 – Flow Chemistry Perspective for C-H Bond Functionalization Strategies for Palladium-Catalyzed Non-Directed and Directed C-H Bond Functionalization 2017, 275-288, DOI: 10.1016/B978-0-12-805254-9.00007-4. Bottecchia, C.; Rubens, M.; Gunnoo, S.; Hessel, V.; Madder, A.; Noël, T. Visible Light-Mediated Selective Arylation of Cysteine in Batch and Flow Angewandte Chemie International Edition 2017, 56 (41), 12701-12707, DOI: 10.1002/anie.201706700. Abdiaj, I.; Bottecchia, C.; Alcazar, J.; Noël, T. Visible-Light-Induced Trifluoromethylation of Highly Functionalized Arenes and Heteroarenes in Continuous Flow Synthesis 2017, 49, 4978-4985, DOI: 10.1055/s-0036-1588527. Laudadio, G.; Straathof, N.J.W. ; Lanting, M.D. ; Knoops, B.; Hessel, V.; Noël, T. An environmentally benign and selective electrochemical oxidation of sulfides and thiols in a continuous-flow microreactor Green Chemistry 2017, 19, 4061 – 4066, DOI: 10.1039/C7GC01973D. Laudadio, G.; Gemoets, H.P.L. ; Hessel, V.; Noël, T. A Flow Synthesis of Diaryliodonium Triflates Journal of Organic Chemistry 2017, 82, 11735-11741, DOI: 10.1021/acs.joc.7b01346. Cambié, D.; Zhao, F.; Hessel, V.; Debije, M.G. ; Noël, T. Every photon counts: understanding and optimizing photon paths in luminescent solar concentrator-based photomicroreactors (LSC-PMs) Reaction Chemistry & Engineering 2017, 2, 561-566, DOI: 10.1039/C7RE00077D. Gruber-Wölfler, H.; Escriba-Gelonch, M.; Noël, T.; Maier, M.C. ; Hessel, V. Effect of acetonitrile-based crystallization conditions on the crystal quality of Vitamin D3 Chemical Engineering & Technology 2017, 40(11), 2016-2024 DOI: 10.1002/ceat.201700080. Gemoets, H. P. L.; Laudadio, G.; Verstraete, K.; Hessel, V.; Noël, T. A Modular Flow Design for the meta-Selective C−H Arylation of Anilines Angewandte Chemie International Edition 2017, 56 (25), 7161-7165 DOI: 10.1002/anie.201703369. Adouama, C.; Keyrouz, R.; Pilet, G.; Monnereau, C.; Gueyrard, D.; Noël, T. and Médebielle M. Access to cyclic gem-difluoroacyl scaffolds via electrochemical and visible light photocatalytic radical tandem cyclization of heteroaryl chlorodifluoromethyl ketones Chemical Communications 2017, 53, 5653-5656 DOI: 10.1039/C7CC02979A. Sharma, U. K.; Gemoets, H.P.L. ; Schröder, F.; Noël, T. and Van der Eycken, E.V. Merger of Visible Light Photoredox Catalysis and C–H Activation for the Room Temperature C-2 Acylation of Indoles in Batch and Flow ACS Catalysis 2017, 7, 3818-3823 DOI: 10.1021/acscatal.7b00840. Kockmann, N.; Thenée, P.; Fleischer-Trebes, C.; Laudadio, G. and Noël, T. Safety Assessment in Development and Operation of Modular Continuous-Flow Processes Reaction Chemistry & Engineering 2017, 2, 258-280 DOI: 10.1039/C7RE00021A. Kuijpers, K.P.L. ; van Dijk, M.A.H. ; Rumeur, Q.; Hessel, V.; Su, Y. and Noël, T. A sensitivity analysis of a numbered-up photomicroreactor system Reaction Chemistry & Engineering 2017, 2, 109-115 DOI: 10.1039/C7RE00024C. 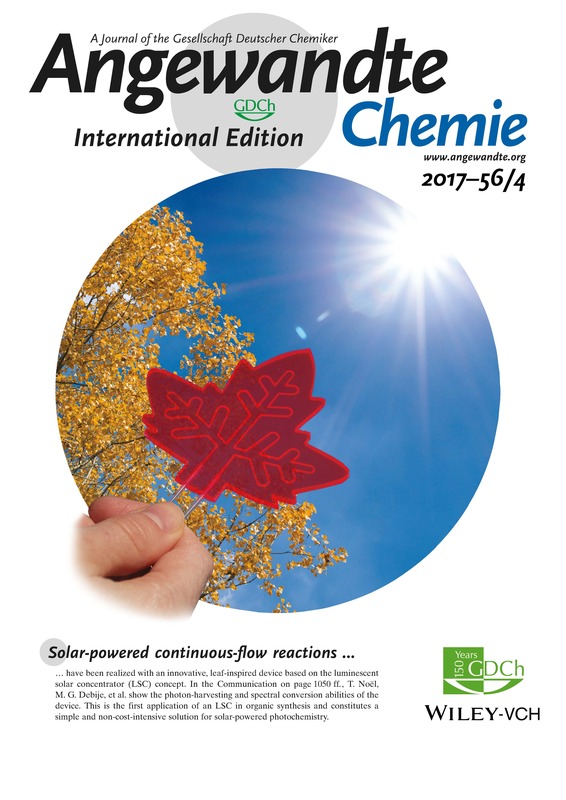 Cambié, D.; Zhao, F.; Hessel, V.; Debije, M. G.; Noël, T. A leaf-inspired luminescent solar concentrator for energy-efficient continuous-flow photochemistry Angewandte Chemie International Edition 2017, 56 (4), 1050-1054 DOI: 10.1002/anie.201611101. Billaud, E.; Shahbazali, E.; Ahamed, M.; Cleeren, F.; Noël, T.; Koole, T.; Verbruggen, A.; Hessel, V.; Bormans, G. Micro-Flow Photosynthesis of New Dienophiles for Inverse-Electron-Demand Diels-Alder Reactions. Potential applications for pretargeted in vivo PET imaging Chemical Science 2017, 8, 1251-1258 DOI: 10.1039/C6SC02933G. Gemoets, H. P. L.; Kalvet, I.; Nyuchev, A.; Erdmann, N.; Hessel, V.; Schoenebeck, F.; Noël, T. Mild and selective base-free C–H arylation of heteroarenes: Experiment and computation Chemical Science 2017, 8, 1046-1055 DOI: 10.1039/C6SC02595A. Deng, Y.; Wei, X-J. ; Wang, H.; Sun, Y.; Noël, T.; Wang, X. Disulfide-Catalyzed Visible-Light-Mediated Oxidative Cleavage of C=C Bonds and Evidence of an Olefin–Disulfide Charge-Transfer Complex Angewandte Chemie International Edition 2017, 56 (3), 832-836 DOI: 10.1002/anie.201607948. Shang, M.; Noël, T.; Su, Y.; Hessel, V. Kinetic study of hydrogen peroxide decomposition at high temperatures and concentrations in two capillary microreactors AIChE Journal 2017, 63 (2), 689-697 DOI: 10.1002/aic.15385. Straathof, N. J. W.; Cramer, S. E.; Hessel, V.; Noël, T. Practical Photocatalytic Trifluoromethylation and Hydrotrifluoromethylation of Styrenes in Batch and Flow Angewandte Chemie International Edition 2016, 55 (50), 15549-15553 DOI: 10.1002/anie.201608297. Gemoets, H.P.L. ; Hessel, V.; Noël, T. Reactor Concepts for Aerobic Liquid Phase Oxidation: Microreactors and Tube Reactors In Liquid Phase Aerobic Oxidation Catalysis – Industrial applications and academic perspectives, Stahl, S. S.; Alsters, P. L., Eds, Wiley-VCH, Berlin, 2016, 399-419, DOI: 10.1002/9783527690121.ch23. Shahbazali, E.; Noël, T.; Hessel, V. Photo-Claisen rearrangement of allyl phenyl ether in microflow: Influence of phenyl core substituents and vision on orthogonality Journal of Flow Chemistry 2016, 6 (3), 252-259 DOI: 10.1556/1846.2016.00029. Su, Y.; Kuijpers, K.P.L. ; Koenig, N.; Shang, M.; Hessel, V.; Noël, T. A mechanistic investigation of the visible light photocatalytic trifluoromethylation of heterocycles using CF3I in flow Chemistry – A European Journal 2016, 22 (35), 12295-12300 DOI: 10.1002/chem.201602596. Bottecchia, C.; Erdmann, N.; Tijssen, P. M. A.; Milroy, L-G.; Brunsveld, L.; Hessel, V.; Noël, T. Batch and flow synthesis of disulfides by visible light induced TiO2­ photocatalysis ChemSusChem 2016, 9 (14), 1781-1785 DOI: 10.1002/cssc.201600602. Bottecchia, C.; Wei, X-J. 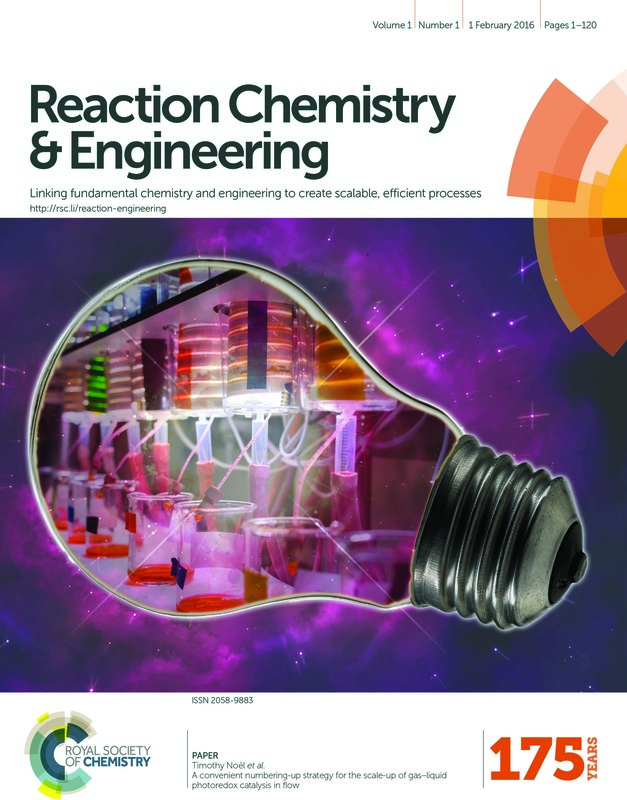 ; Kuijpers, K. P. L.; Hessel, V.; Noël, T. Visible light-induced trifluoromethylation and perfluoroalkylation of cysteine residues in batch and continuous flow J. Org. Chem. 2016, 81 (16), 7301-7307 DOI: 10.1021/acs.joc.6b01031. Borukhova, S.; Noël, T.; Metten, B.; De Vos, E.; Hessel, V. From alcohol to 1,2,3-triazole via multi-step continuous-flow synthesis of rufinamide precursor Green Chemistry 2016, 18, 4947-4953 DOI: 10.1039/C6GC01133K. Su, Y.; Kuijpers, K. P. L.; Hessel, V.; Noël, T. A convenient numbering-up strategy for the scale-up of gas–liquid photoredox catalysis in flow. Reaction Chemistry & Engineering 2016, 1, 73-81 DOI: 10.1039/C5RE00021A. 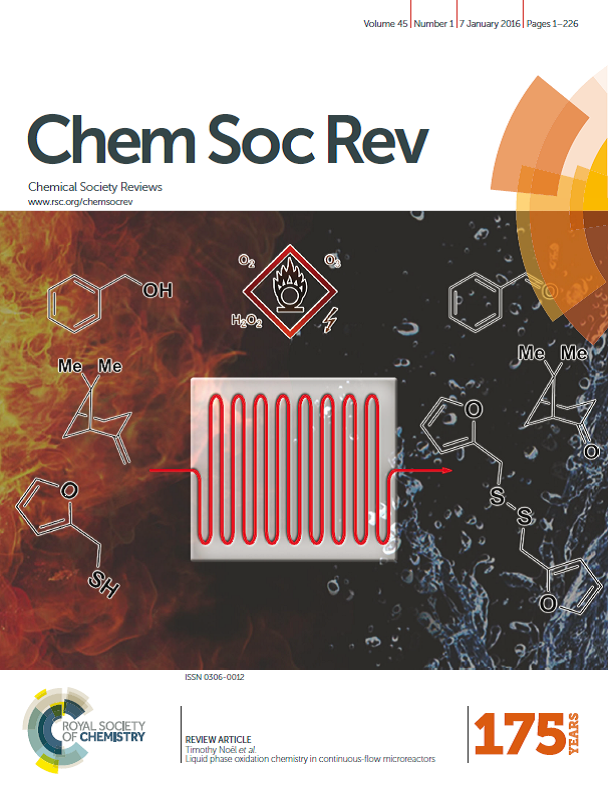 Borukhova, S.; Noël, T.; Hessel, V. Hydrogen Chloride Gas in Solvent-Free Continuous Conversion of Alcohols to Chlorides in Microflow. Organic Process Research & Development 2016, 20 (2), 568-573 DOI: 10.1021/acs.oprd.6b00014. 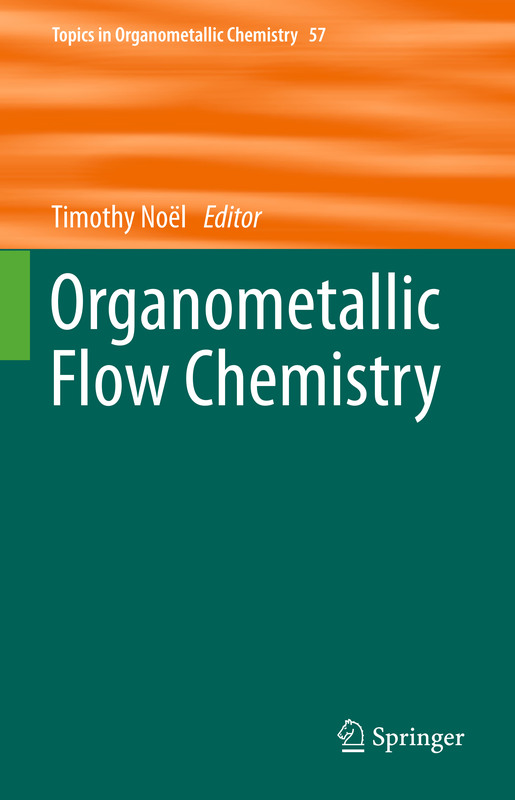 Noël, T.; Su, Y.; Hessel, V. Beyond Organometallic Flow Chemistry: The Principles Behind the Use of Continuous-Flow Reactors for Synthesis. Topics in Organometallic Chemistry 2016, 57, 1-41 DOI: 10.1007/3418_2015_152. Cambié, D.; Bottecchia, C.; Straathof, N. J. W.; Hessel, V.; Noël, T. Applications of Continuous-Flow Photochemistry in Organic Synthesis, Material Science, and Water Treatment. Chemical Reviews 2016, 116 (17), 10276-10341 DOI: 10.1021/acs.chemrev.5b00707. Straathof, N. J. W.; Su, Y.; Hessel, V.; Noël, T. Accelerated gas-liquid visible light photoredox catalysis with continuous-flow photochemical microreactors. Nature Protocols 2016, 11 (1), 10-21 DOI: 10.1038/nprot.2015.113. Gemoets, H. P. L.; Su, Y.; Shang, M.; Hessel, V.; Luque, R.; Noël, T. Liquid phase oxidation chemistry in continuous-flow microreactors. Chemical Society Reviews 2016, 45 (1), 83-117 DOI: 10.1039/C5CS00447K. 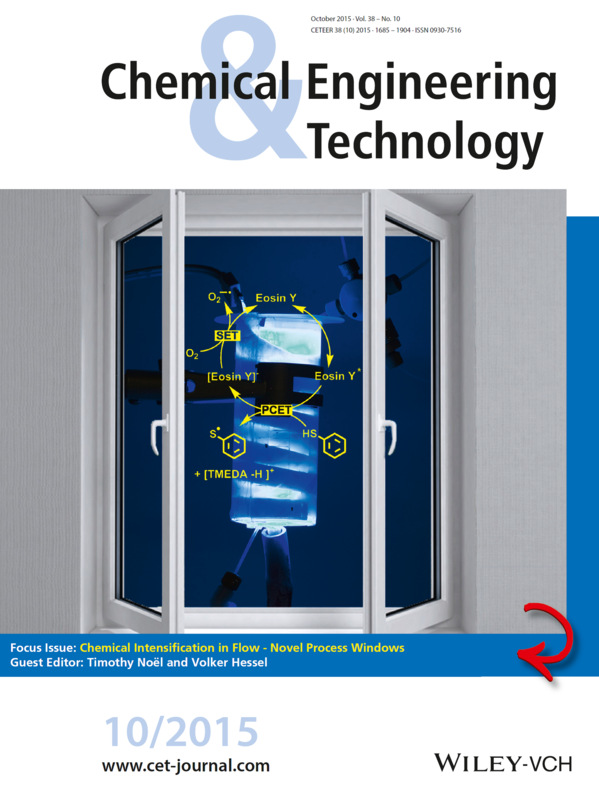 Vural Gürsel, I.; Kurt, S. K.; Aalders, J.; Wang, Q.; Noël, T.; Nigam, K. D. P.; Kockmann, N.; Hessel, V. Utilization of milli-scale coiled flow inverter in combination with phase separator for continuous flow liquid–liquid extraction processes. Chemical Engineering Journal 2016, 283, 855-868 DOI: 10.1016/j.cej.2015.08.028. Borukhova, S.; Noël, T.; Hessel, V. Continuous-Flow Multistep Synthesis of Cinnarizine, Cyclizine, and a Buclizine Derivative from Bulk Alcohols. ChemSusChem 2016, 9 (1), 67-74 DOI: 10.1002/cssc.201501367. Stouten, S. C.; Noël, T.; Wang, Q.; Beller, M.; Hessel, V. Continuous ruthenium-catalyzed methoxycarbonylation with supercritical carbon dioxide. Catalysis Science & Technology 2016, 6, 4712-4717 DOI: 10.1039/C5CY01883H. Shang, M.; Noël, T.; Su, Y.; Hessel, V. High Pressure Direct Synthesis of Adipic Acid from Cyclohexene and Hydrogen Peroxide via Capillary Microreactors. Industrial & Engineering Chemistry Research 2016, 55 (10), 2669-2676 DOI: 10.1021/acs.iecr.5b04813. Erdmann, N.; Su, Y.; Bosmans, B.; Hessel, V.; Noel, T. Palladium-catalyzed aerobic oxidative coupling of o-xylene in flow: a safe and scalable protocol for cross-dehydrogenative coupling. Organic Process Research & Development 2016, 20 (4), 831-835 DOI: 10.1021/acs.oprd.6b00044. Shang, M.; Noël, T.; Wang, Q.; Su, Y.; Miyabayashi, K.; Hessel, V.; Hasebe, S. 2- and 3-Stage temperature ramping for the direct synthesis of adipic acid in micro-flow packed-bed reactors. Chemical Engineering Journal 2015, 260, 454-462 DOI: 10.1016/j.cej.2014.08.061. Shahbazali, E.; Spapens, M.; Kobayashi, H.; Ookawara, S.; Noël, T.; Hessel, V. Connected nucleophilic substitution-Claisen rearrangement in flow – Analysis for kilo-lab process solutions with orthogonality. Chemical Engineering Journal 2015, 281, 144-154 DOI: 10.1016/j.cej.2015.06.020. Stouten, S. C.; Noël, T.; Wang, Q.; Hessel, V. Supported Liquid Phase Catalyst coating in micro flow Mizoroki–Heck reaction. Chemical Engineering Journal 2015, 279, 143-148 DOI: 10.1016/j.cej.2015.05.026. Su, Y.; Hessel, V.; Noël, T. A compact photomicroreactor design for kinetic studies of gas-liquid photocatalytic transformations. AIChE Journal 2015, 61 (7), 2215-2227 DOI: 10.1002/aic.14813. Talla, A.; Driessen, B.; Straathof, N. J. W.; Milroy, L. -G.; Brunsveld, L.; Hessel, V.; Noël, T. Metal-Free Photocatalytic Aerobic Oxidation of Thiols to Disulfides in Batch and Continuous-Flow. Advanced Synthesis & Catalysis 2015, 357 (10), 2180-2186 DOI: 10.1002/adsc.201401010. Vural Gürsel, I.; Aldiansyah, F.; Wang, Q.; Noël, T.; Hessel, V. Continuous metal scavenging and coupling to one-pot copper-catalyzed azide-alkyne cycloaddition click reaction in flow. Chemical Engineering Journal 2015, 270, 468-475 DOI: 10.1016/j.cej.2015.02.035. Vural Gürsel, I.; Noël, T.; Wang, Q.; Hessel, V. Separation/recycling methods for homogeneous transition metal catalysts in continuous flow. Green Chemistry 2015, 17 (4), 2012-2026 DOI: 10.1039/C4GC02160F. Su, Y.; Talla, A.; Hessel, V.; Noël, T. Controlled Photocatalytic Aerobic Oxidation of Thiols to Disulfides in an Energy-Efficient Photomicroreactor. Chemical Engineering & Technology 2015, 38 (10), 1733-1742 DOI: 10.1002/ceat.201500376. Borukhova, S.; Seeger, A. D.; Noël, T.; Wang, Q.; Busch, M.; Hessel, V. Pressure-Accelerated Azide-Alkyne Cycloaddition: Micro Capillary versus Autoclave Reactor Performance. ChemSusChem 2015, 8 (3), 504-512 DOI: 10.1002/cssc.201403034. Habraken, E.; Haspeslagh, P.; Vliegen, M.; Noël, T. Iridium(I)-Catalyzed Ortho -Directed Hydrogen Isotope Exchange in Continuous-Flow Reactors. Journal of Flow Chemistry 2015, 5 (1), 2-5 DOI: 10.1556/JFC-D-14-00033. Hessel, V.; Noël, T. Topical : what’s new about flow catalysis – Is such ‘Merger’ better for heterocat, homocat and biocat? Chimica Oggi 2015, 33 (2), 2-3. Hessel, V.; Noël, T. Heterocat, homocat and biocat: what does better flow? Chimica Oggi 2015, 33 (2), 4-8. 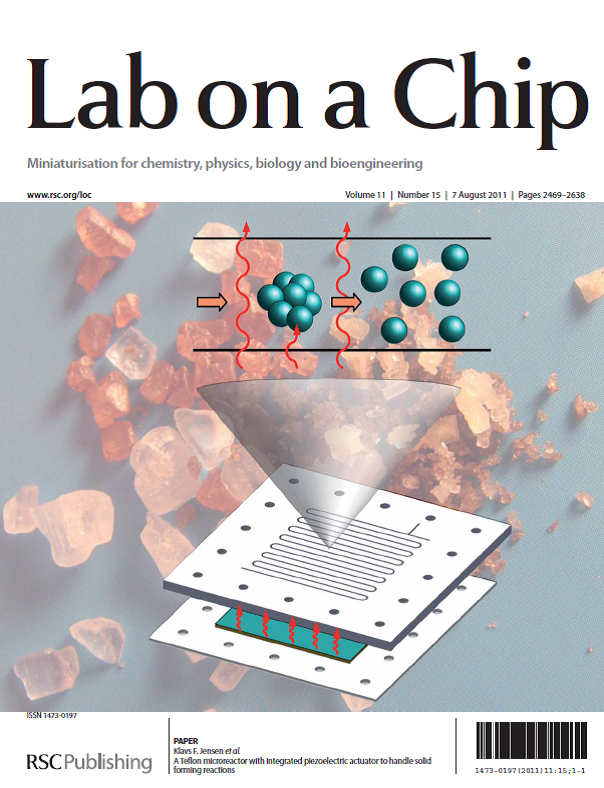 Schröder, F.; Ojeda, M.; Erdmann, N.; Jacobs, J.; Luque, R.; Noël, T.; Van Meervelt, L.; Van der Eycken, J.; Van der Eycken, E. V. Supported gold nanoparticles as efficient and reusable heterogeneous catalyst for cycloisomerization reactions. Green Chemistry 2015, 17 (6), 3314-3318 DOI: 10.1039/C5GC00430F. Schröder, F.; Erdmann, N.; Noël, T.; Luque, R.; Van der Eycken, E. V. Leaching-Free Supported Gold Nanoparticles Catalyzing Cycloisomerizations under Microflow Conditions. Advanced Synthesis & Catalysis 2015, 357 (14-15), 3141-3147 DOI: 10.1002/adsc.201500628. Noël, T.; Hessel, V. Cross-Coupling Chemistry in Continuous Flow. In New Trends in Cross-Coupling: Theory and Applications; The Royal Society of Chemistry, 2015; pp 610-644; DOI: 10.1039/9781782620259-00610. Denčić, I.; Ott, D.; Kralisch, D.; Noël, T.; Meuldijk, J.; de Croon, M.; Hessel, V.; Laribi, Y.; Perrichon, P. Eco-efficiency Analysis for Intensified Production of an Active Pharmaceutical Ingredient: A Case Study. Organic Process Research & Development 2014, 18 (11), 1326-1338 DOI: 10.1021/op5000573. Stouten, S. C.; Noël, T.; Wang, Q.; Hessel, V. Catalyst retention in continuous flow with supercritical carbon dioxide. Chemical Engineering and Processing: Process Intensification 2014, 83, 26-32 DOI: 10.1016/j.cep.2014.03.017. Straathof, N. J. W.; Gemoets, H. P. L.; Wang, X.; Schouten, J. C.; Hessel, V.; Noël, T. Rapid Trifluoromethylation and Perfluoroalkylation of Five-Membered Heterocycles by Photoredox Catalysis in Continuous Flow. 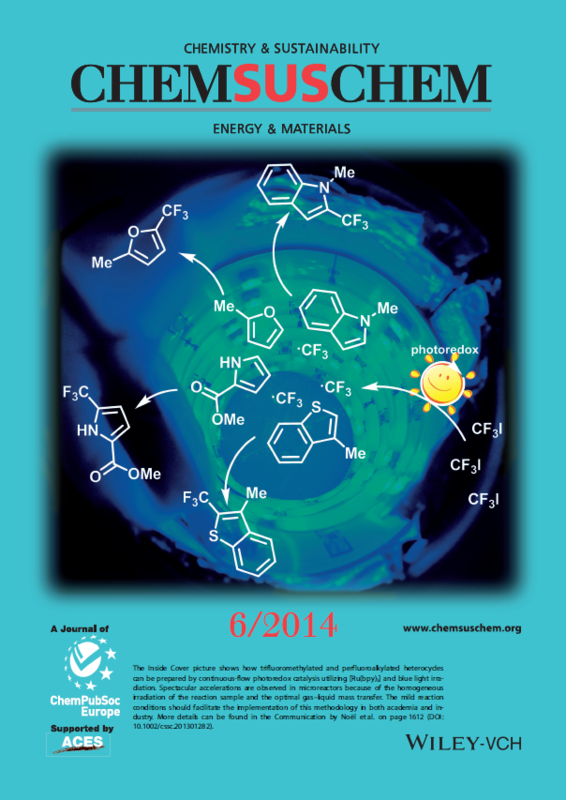 ChemSusChem 2014, 7 (6), 1612-1617 DOI: 10.1002/cssc.201301282. Hessel, V.; Tibhe, J.; Noël, T.; Wang, Q. Biotechnical Micro-Flow Processing at the EDGE – Lessons to be learnt for a Young Discipline. Chemical and Biochemical Engineering Quarterly Journal 2014, 28 (2), 167-188 DOI: 10.15255/CABEQ.2014.1939. Gemoets, H. P. L.; Hessel, V.; Noël, T. Aerobic C–H Olefination of Indoles via a Cross-Dehydrogenative Coupling in Continuous Flow. Organic Letters 2014, 16 (21), 5800-5803 DOI: 10.1021/ol502910e. Baraldi, P. T.; Noël, T.; Wang, Q.; Hessel, V. The accelerated preparation of 1,4-dihydropyridines using microflow reactors. Tetrahedron Letters 2014, 55 (13), 2090-2092 DOI: 10.1016/j.tetlet.2014.02.041. 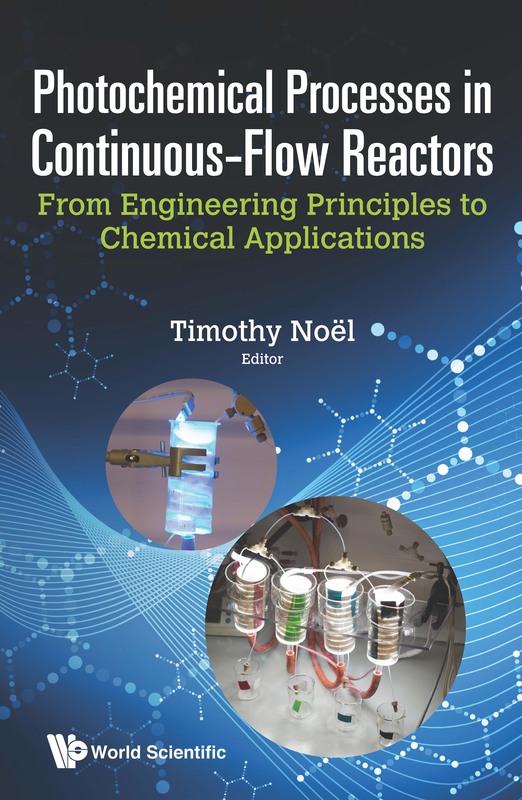 Su, Y.; Straathof, N. J. W.; Hessel, V.; Noël, T. Photochemical Transformations Accelerated in Continuous-Flow Reactors: Basic Concepts and Applications. 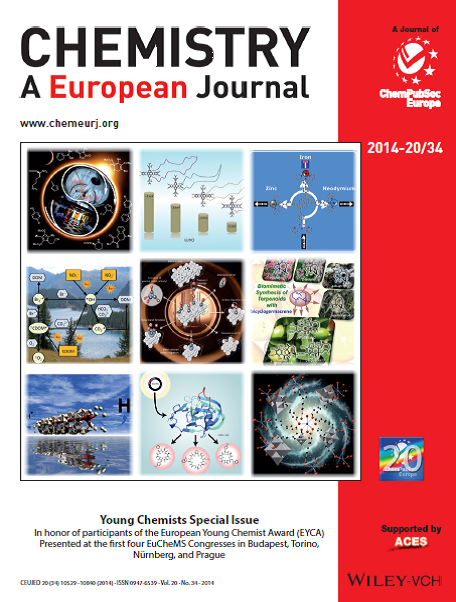 Chemistry – A European Journal 2014, 20 (34), 10562-10589 DOI: 10.1002/chem.201400283. Straathof, N. J. W.; Tegelbeckers, B. J. P.; Hessel, V.; Wang, X.; Noël, T. A mild and fast photocatalytic trifluoromethylation of thiols in batch and continuous-flow. Chemical Science 2014, 5 (12), 4768-4773 DOI: 10.1039/C4SC01982B. Gürsel, I. V.; Wang, Q.; Noël, T.; Kolb, G.; Hessel, V.; Van Veen, A. C. Heat-integrated novel process of liquid fuel production from bioresources – process simulation and costing study. Chemical Engineering Transactions 2014, 39 (Special Issue), 931-936 DOI: 10.3303/CET1439156. Hessel, V.; Shahbazali, E.; Noël, T.; Zelentsov, S. Claisen-Umlagerung im Rühr- und Durchflussbetrieb: Verständnis des Mechanismus und Steuerung der Einflussgrößen. 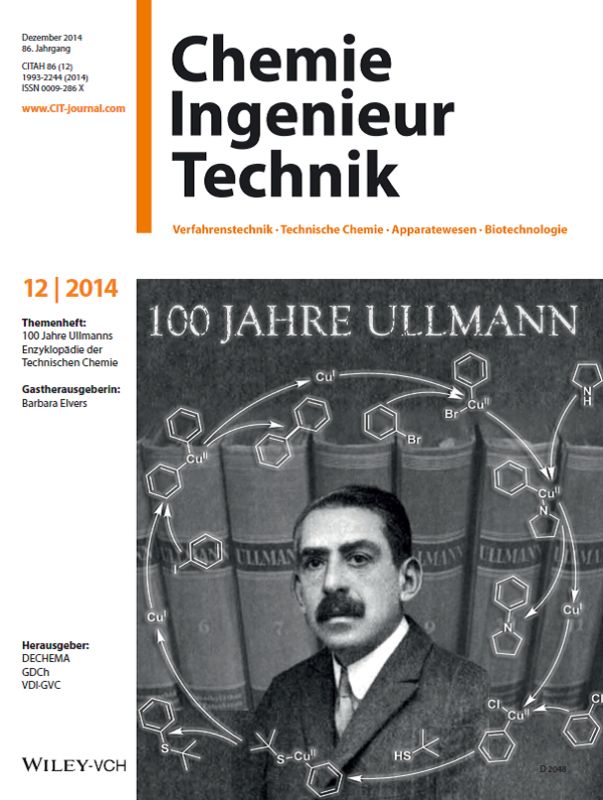 Chemie Ingenieur Technik 2014, 86 (12), 2160-2179 DOI: 10.1002/cite.201400125. Straathof, N.; Osch, D.; Schouten, A.; Wang, X.; Schouten, J.; Hessel, V.; Noël, T. Visible Light Photocatalytic Metal-Free Perfluoroalkylation of Heteroarenes in Continuous Flow. Journal of Flow Chemistry 2014, 4 (1), 12-17 DOI: 10.1556/JFC-D-13-00032. Zelentsov, S.; Hessel, V.; Shahbazali, E.; Noël, T. The Claisen Rearrangement – Part 1: Mechanisms and Transition States, Revisited with Quantum Mechanical Calculations and Ultrashort Pulse Spectroscopy. ChemBioEng Reviews 2014, 1 (5), 230-240 DOI: 10.1002/cben.201400021. Hessel, V.; Shahbazali, E.; Noël, T.; Zelentsov, S. The Claisen Rearrangement – Part 2: Impact Factor Analysis of the Claisen Rearrangement, in Batch and in Flow. ChemBioEng Reviews 2014, 1 (6), 244-261 DOI: 10.1002/cben.201400022. Noël, T.; Hessel, V. Micro Process Technology, 3. Applications. In Ullmann’s Encyclopedia of Industrial Chemistry; Wiley-VCH Verlag GmbH & Co. KGaA: Weinheim, Germany, 2014; pp 1-42; DOI: 10.1002/14356007.o16_o02. Noël, T. Micro Flow Chemistry: New Possibilities for Synthetic Chemists. In Discovering the Future of Molecular Sciences; Wiley-VCH Verlag GmbH & Co. KGaA: Weinheim, Germany, 2014; pp 137-164; DOI: 10.1002/9783527673223.ch6. Hessel, V.; Kralisch, D.; Kockmann, N.; Noël, T.; Wang, Q. Novel Process Windows for Enabling, Accelerating, and Uplifting Flow Chemistry. ChemSusChem 2013, 6 (5), 746-789 DOI: 10.1002/cssc.201200766. Borukhova, S.; Noël, T.; Metten, B.; de Vos, E.; Hessel, V. Solvent- and Catalyst-Free Huisgen Cycloaddition to Rufinamide in Flow with a Greener, Less Expensive Dipolarophile. ChemSusChem 2013, 6 (12), 2220-2225 DOI: 10.1002/cssc.201300684. Shang, M.; Noël, T.; Wang, Q.; Hessel, V. Packed-Bed Microreactor for Continuous-Flow Adipic Acid Synthesis from Cyclohexene and Hydrogen Peroxide. Chemical Engineering and Technology, 2013, 36, 1001-1009 DOI: 10.1002/ceat.201200703. Wang, X.; Cuny, G. D.; Noël, T. A Mild, One-Pot Stadler-Ziegler Synthesis of Arylsulfides Facilitated by Photoredox Catalysis in Batch and Continuous-Flow. Angewandte Chemie International Edition 2013, 52 (30), 7860-7864 DOI: 10.1002/anie.201303483. Stouten, S. C.; Wang, Q.; Noël, T.; Hessel, V. A supported aqueous phase catalyst coating in micro flow Mizoroki–Heck reaction. Tetrahedron Letters 2013, 54 (17), 2194-2198 DOI: 10.1016/j.tetlet.2013.02.064. Gürsel, I. V.; Wang, Q.; Noël, T.; Hessel, V. Implementation of heat integration for efficient process design of direct adipic acid synthesis in flow. Chemical Engineering Transactions, 2013, 35, 775-780 DOI: dx.doi.org/10.3303/CET1335129. Kobayashi, H.; Driessen, B.; van Osch, D. J. G. P.; Talla, A.; Ookawara, S.; Noël, T.; Hessel, V. The impact of Novel Process Windows on the Claisen rearrangement. Tetrahedron 2013, 69 (14), 2885-2890 DOI: 10.1016/j.tet.2013.02.038. Shahbazali, E.; Hessel, V.; Noël, T.; Wang, Q. Metallic nanoparticles made in flow and their catalytic applications in organic synthesis. Nanotechnology Reviews 2013, 3 (1), 65-86 DOI: 10.1515/ntrev-2013-0017. Denčić, I.; Noël, T.; Meuldijk, J.; de Croon, M.; Hessel, V. Micro reaction technology for valorization of biomolecules using enzymes and metal catalysts. Engineering in Life Sciences 2013, 13 (4), 326-343 DOI: 10.1002/elsc.201200149. Denčić, I.; de Vaan, S.; Noël, T.; Meuldijk, J.; de Croon, M.; Hessel, V. Lipase-Based Biocatalytic Flow Process in a Packed-Bed Microreactor. Industrial & Engineering Chemistry Research 2013, 52 (32), 10951-10960 DOI: 10.1021/ie400348f. Noël, T.; Wang, X.; Hessel, V. Accelerating photoredox catalysis in continuous microflow. Chimica Oggi 2013, 31 (3), 10-14. Noël, T.; Van der Eycken, J. Ferrocene-derived P,N ligands: synthesis and application in enantioselective catalysis. Green Processing and Synthesis 2013, 2 (4), 297-309 DOI: 10.1515/gps-2013-0036. Vural-Gürsel, I.; Wang, Q.; Noël, T.; Hessel, V.; Tinge, J. T. Improving Energy Efficiency of Process of Direct Adipic Acid Synthesis in Flow Using Pinch Analysis. Industrial & Engineering Chemistry Research 2013, 52 (23), 7827-7835 DOI: 10.1021/ie4002052. Noël, T.; Hessel, V. Membrane Microreactors: Gas-Liquid Reactions Made Easy. ChemSusChem 2013, 6 (3), 405-407 DOI: 10.1002/cssc.201200913. Tibhe, J. D.; Fu, H.; Noël, T.; Wang, Q.; Meuldijk, J.; Hessel, V. Flow synthesis of phenylserine using threonine aldolase immobilized on Eupergit support. Beilstein Journal of Organic Chemistry 2013, 9, 2168-2179 DOI: 10.3762/bjoc.9.254. Stouten, S. C.; Noël, T.; Wang, Q.; Hessel, V. A View Through Novel Process Windows. Australian Journal of Chemistry 2013, 66 (2), 121 DOI: 10.1071/CH12465. Noël, T.; Hessel, V. Chemical Intensification in Flow Chemistry through Harsh Reaction Conditions and New Reaction Design. In Microreactors in Preparative Chemistry; Wiley-VCH Verlag GmbH & Co. KGaA: Weinheim, Germany, 2013; pp 273-295; DOI: 10.1002/9783527652891.ch11. Fu, H.; Dencic, I.; Tibhe, J.; Sanchez Pedraza, C. A.; Wang, Q.; Noel, T.; Meuldijk, J.; de Croon, M.; Hessel, V.; Weizenmann, N.; et al. Threonine aldolase immobilization on different supports for engineering of productive, cost-efficient enzymatic microreactors. Chemical Engineering Journal 2012, 207-208, 564-576 DOI: 10.1016/j.cej.2012.07.017. Cortese, B.; Noel, T.; de Croon, M. H. J. M.; Schulze, S.; Klemm, E.; Hessel, V. Modeling of Anionic Polymerization in Flow With Coupled Variations of Concentration, Viscosity, and Diffusivity. 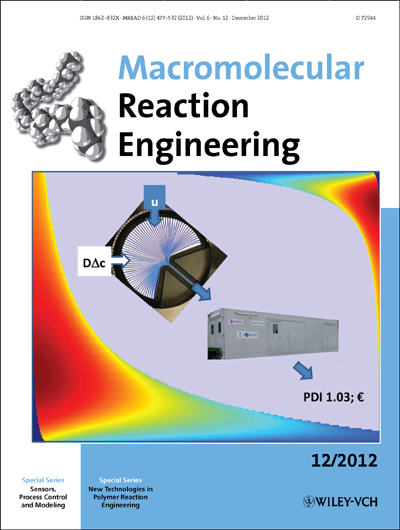 Macromolecular Reaction Engineering 2012, 6 (12), 507-515 DOI: 10.1002/mren.201200027. Varas, A. C.; Noël, T.; Wang, Q.; Hessel, V. Copper(I)-Catalyzed Azide-Alkyne Cycloadditions in Microflow: Catalyst Activity, High-T Operation, and an Integrated Continuous Copper Scavenging Unit. ChemSusChem 2012, 5 (9), 1703-1707 DOI: 10.1002/cssc.201200323. Gürsel, I. V.; Hessel, V.; Wang, Q.; Noël, T.; Lang, J. Window of opportunity – potential of increase in profitability using modular compact plants and micro-reactor based flow processing. Green Processing and Synthesis 2012, 1 (4), 315-336 DOI: 10.1515/gps-2012-0046. Hessel, V.; Noël, T. Micro Process Technology, 2. Processing. In Ullmann’s Encyclopedia of Industrial Chemistry; Wiley-VCH Verlag GmbH & Co. KGaA: Weinheim, Germany, 2012; DOI: 10.1002/14356007.b16_b37.pub2. Hessel, V.; Noël, T. Micro Process Technology, 1. Introduction. In Ullmann’s Encyclopedia of Industrial Chemistry; Wiley-VCH Verlag GmbH & Co. KGaA: Weinheim, Germany, 2012; DOI: 10.1002/14356007.q16_q01. Noël, T. Green is the future of chemistry: report of Taminco’s second Green Footsteps Event at the i-SUP 2012. Green Processing and Synthesis 2012, 1 (4), 399-401 DOI: 10.1515/gps-2012-0044. Bert, K.; Noël, T.; Kimpe, W.; Goeman, J. L.; Van der Eycken, J. Chiral imidate-ferrocenylphosphanes: synthesis and application as P,N-ligands in iridium(I)-catalyzed hydrogenation of unfunctionalized and poorly functionalized olefins. Organic & Biomolecular Chemistry 2012, 10 (42), 8539-8550 DOI: 10.1039/c2ob25871d. Gürsel, I. V.; Wang, Q.; Noël, T.; Hessel, V. Process-Design Intensification – Direct synthesis of adipic acid in flow. Chemical Engineering Transactions 2012, 29, 565-570 DOI: 10.3303/CET1229095. Hessel, V.; Vural Gürsel, I.; Wang, Q.; Noël, T.; Lang, J. Potential Analysis of Smart Flow Processing and Micro Process Technology for Fastening Process Development: Use of Chemistry and Process Design as Intensification Fields. Chemical Engineering & Technology 2012, 35 (7), 1184-1204 DOI: 10.1002/ceat.201200038. Hessel, V.; Gürsel, I. V.; Wang, Q.; Noël, T.; Lang, J. Potenzialanalyse von Milli- und Mikroprozesstechniken für die Verkürzung von Prozessentwicklungszeiten – Chemie und Prozessdesign als Intensivierungsfelder. Chemie Ingenieur Technik 2012, 84 (5), 660-684 DOI: 10.1002/cite.201200007.